In March, 2013, the non-profit, open-source research organization, OCEARCH, caught a four-metre, 900 kg, female great white shark off the Atlantic coast of Florida near Jacksonville, then released it after attaching monitoring and tracking devices. 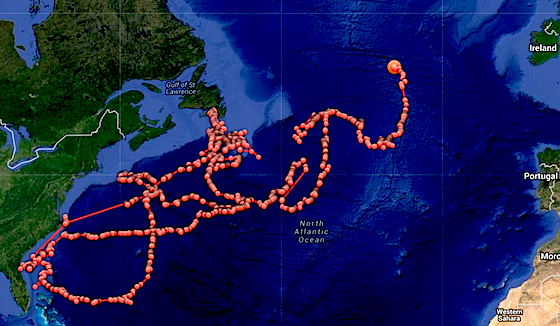 In the year since, the shark has travelled 31,000 kilometres, visiting Cape Hatteras, Bermuda, George’s Bank, Placentia Bay, and the Grand Banks, before crossing the mid-Atlantic ridge to a point 1200 kilometres off the coast of Ireland. 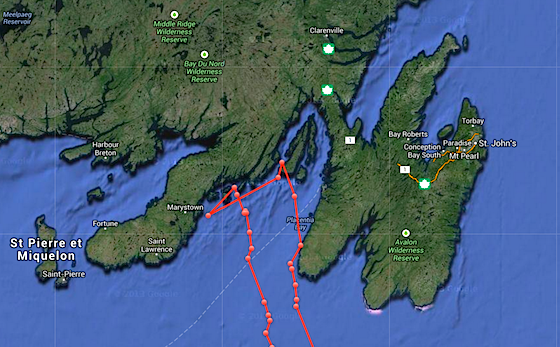 You can follow Lydia’s travels on OCEARCH’s interactive, live-tracking map. You can follow OCEARCH on Facebook, Twitter, and Instagram. Here’s a video of Lydia’s capture and tagging. The UK Telegraph has more on the story. H/T: Alexis Madrigal.